This design copies the look of parquet flooring. Being in the Walcrest line of the Stamford Wallpaper Company, the design is machine-printed with engraved rollers using oil-based inks. This is the same printing technique used to make the first wipeable wallpapers in the 1870s. This differs from standard machine prints where printing rollers use a raised surface to carry the pigments. Printing with engraved rollers allows the design to be very detailed and contain a good amount of subtleties in the printed inks, something not possible with traditional printing rollers. These differences create a more realistic-looking woodgrain. While this design does mimic a parquet floor design it was intended for use on the wall which could create a novel paneled effect. 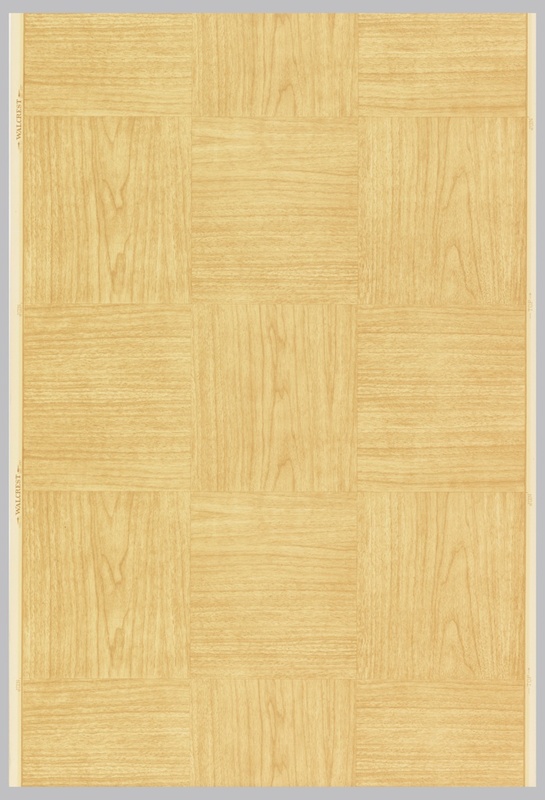 As an interesting side note, Cooper Hewitt does contain at least a couple examples of papers that were indeed intended for use on floors. An article appearing in “Decorator & Furnisher” in 1883 talks about these floor papers and gives instructions on how to apply them. Woodgrain patterns are one of those endearing genres that never seem to go out of style. There are numerous brilliant examples from the early nineteenth century showing woodgrain patterns that are hand painted, combed, or woodblock printed, that are amazingly realistic. Later examples in the collection show that these woodgrain designs have been produced using just about every technique used in wallpaper production, including along with the hand processes mentioned, machine-printing, silk-screen, and lithography. Some of the original Con-Tact brand self-adhesive vinyl wallcoverings were woodgrain patterns. One reason for the long popularity of these designs is that they offer an easy, affordable way to introduce the warmth of wood into your home.